Another look at the possibilities and capabilities of view camera movements with regular contributor, David M.
There are advantages to using a view camera. There is the improved aerobic health caused by lugging a small mountain of kit around. Any view camera easily outranks any kind of Leica in status, but that’s not important to followers of the One True Path, who are above any kind of camera snobbery. I merely mention it in passing. And you get those lovely big negatives and the ability to control their development one by one. It’s true that you have to think a bit about what you’re doing, but thinking is no hardship. We are homo sapiens, not homo snapiens. Some of us even enjoy thinking. But it can’t be denied that a view camera can be intimidating to a newcomer – all those knobs and fiddly things, so very different from the point-and-shoot convenience and instant coolness of the iPhone. Let us begin by remembering that all cameras are just boxes to carry round a bit of darkness. A view camera is a flexible bag to do the same thing. And nowadays, it’s easy to understand how to use the ground glass: it’s just like your iPhone. Sometimes people are surprised to find that focusing involves physically moving the lens back and forth from the film plane, but that’s because the remarkable convenience of modern cameras has shielded us all from reality. Almost everyone is entranced by the image and almost everybody is surprised to see that it’s upside down. Some are surprised that it’s in colour. It’s reversed left-to-right too, but that comes later. There’s a lesson to be learned from the upside-down-ness. When rays of light pass through the lens, they all cross over at a single point in the middle of the lens. 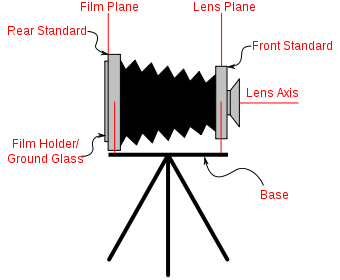 A lens is nothing but an amplified pinhole and remembering this will make it easier to think about its geometry, if we need to. You need a dark cloth to make the image seem bright enough to view. A hand-held camera uses your eyebrows to do the same thing, but the One True Camera needs the One True Robe of Perfect Viewing. So, there you stand, robed in darkness, examining the image on your ground glass screen. You compose at leisure, making minute adjustments to the framing until you’re happy. You focus the image by moving one of the standards (the frames that hold the lens and the film, respectively) back and forth. Not all the image is in focus. When this lovely big rock in the foreground is pin sharp, that interesting tree in the distance is blurred. When we adjust the camera to get the tree sharp, the rock is blurred. We may already know that if we stop down, we shall get more depth of field, but will it be enough? The exposure time will increase. It may be windy. The lens stop may not stop down far enough. We might have left our DoF tables at home. Reciprocity may rear its pale head. The price of sharpness may be altogether too high. At this point, it’s customary to introduce Captain Theodor Scheimpflug, or, for the serious addict, Harold M Merklinger. You may Google them at your convenience. Both of them are worth exploring. … and no doubt they’re right. I know a man in Norfolk who could explain it if we asked him. Is there another way to think about this? What does this tell us? 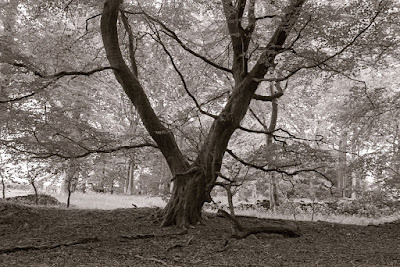 It tells us that the film has to be in two different places at once to get two objects, (our lovely big rock and the interesting tree) at different distances, in focus. Obviously impossible. Impossible with a fixed camera no doubt, but we are using a bendy, wiggly, adjustable view camera. We can adjust it so that the part of the ground glass with the tree on it is the right distance from the lens and the bit with the rock is at the right distance too, both at the same time. All we have to do is tilt the back of the camera until both seem sharp on the ground glass. It’s easier than it sounds. You can demonstrate this for yourself, but you’ll need a patient friend to help. Set up and level your camera in some place where you can see two convenient objects, one in the foreground and one in the distance. They don’t have to be trees or rocks. Your camera bag and your bedroom window will do, so you can stay at home, close to the kettle and the biscuits. Frame your picture to include the bag or rock in the near foreground and the tree or window in the distance. The image will be upside down, so the bag will be at the top of the frame and the window at the bottom. Try to get them near the top and bottom edges, respectively. You might have to move the tripod. Focus the camera carefully on the bag at the top of the frame and ignore the window. Keep the lens wide open. Summon or bribe your patient friend. Get them to stand beside the camera and hold the top of the rear standard (the one with the ground glass) and keep it in exactly the same place. Now loosen off the tilt control and re-focus on the window, at the bottom of the ground glass by moving the rear standard. Warn your friend what’s going to happen or they may fear that they’re breaking the camera. The top of the frame should stay where it is (focused on the bag) and only the bottom should move as you re-focus. When you’re done, tighten everything up again. If all goes well, the rear standard will be tilted and the ground glass will show both the bag and the window in focus, but at different distances. Happily, as far as focus is concerned, it turns out that it’s the angle between the two that’s important and it doesn’t matter if we tilt the back, as we did here, or the front, with the lens, and consequently we can get the same control of focus by tilting the front. There are good reasons for using the front, because moving the back away from vertical has other effects that we may not want. You could try repeating this experiment with the front standard, but I think it’s easier to understand this way. Remember, this is only a demonstration and not a practical working method. Back to nice Captain Scheimpflug. He discovered that when you tilt either part of the camera in this way, the film plane, the lens plane and the invisible plane of focus are linked like the pages of a book, meeting at a Hinge Point, usually somewhere under the camera. This is the famous Scheimpflug Rule. Once you know about it, you can stand beside your camera imagining invisible lines meeting at the hinge and visualising where the plane of focus lies. You will find diagrams in all textbooks on using view cameras. Although it’s not mentioned as often, the same method can be used sideways so that if you are facing a building at an angle, you can re-arrange the camera, by Swinging, (as it’s called when we rotate the standards sideways), the front or back in the same way, to get everything in focus. I first came across this in a Victorian textbook that suggested that it was useful for photographing processions. I was grateful to discover this, but I’ve never had to do it. Remember to thank your patient friend or hand over the bribe. One of the deciding factors in whether to use front or rear tilt is lens coverage. If your lens barely covers the format,then tilting the front standard may vignette the subject. My 265mm lens barely covers 7X17, so I use rear movements almost exclusively. You are quite right. There are always trade-offs and balances in LF photography. Always new problems to engage the interest. Not really possible to deal with all of them in a short essay. As you'll already know, the usual reason to choose one or the other standard is the geometry of the image. But 7x17? Wow! A hero! What sort of thing do you use it to photograph? Surely more than schools and banquets.